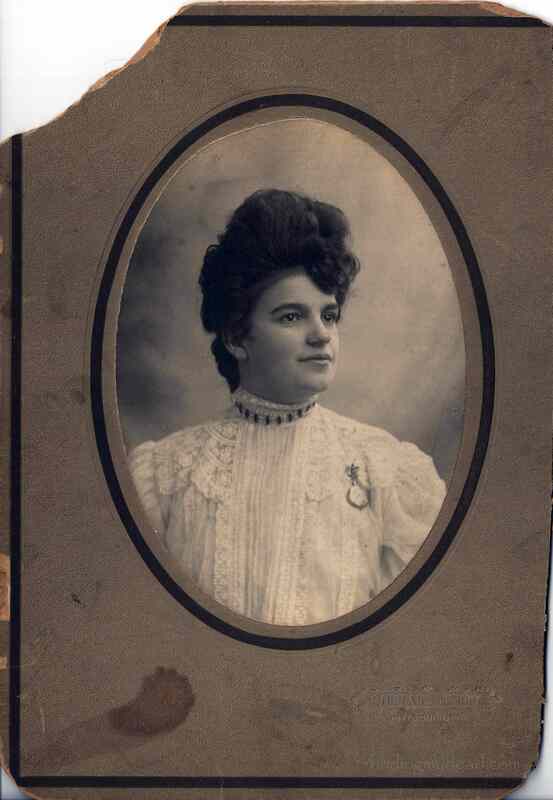 This photograph is the only one I have ever seen of Mildred Wetzel, my great-grandmother’s aunt. I estimate that this is taken somewhere around 1910, give or take a couple years. It is funny how after years of looking at this photograph, it was only today that I noticed that it was taken by a Pittsburgh photographer. Pittsburgh…what was she doing in Pittsburgh? Was she alone? How did she end up there? Aunt Mil is one of my female ancestors that drives me slightly crazy as birth, death and census records provide just enough information to show that at some point between 1900 and 1920 she not only left the small coal town in which she was born but she also left behind her father, siblings, cousins and friends. Everything and everyone she knew was in Trevorton, so how did she end up in Peoria, Illinois? Though I have yet to find her on the 1910 census, I was able to find death and burial records for some of her children starting in 1918; this has left me with an 18 year gap. Multiple census records for her oldest son, Milton, show that he was born in Washington D.C. in 1909. I haven’t yet found the birth place of her second child, Harry, who was born in 1911. Census and death records for her third child show that Myrtle Ione was born in Peoria, Ill in 1912. Millie’s husband Frank passed away in 1924 in Peoria and like their children who predeceased him, he was taken to Trevorton for burial. As of the 1930 census, the young widow was still living in Peoria. By 1940, Mildred had married William Patterson and they were living in Fairfax County, Virginia; this is where most of her descendants still live. 1887 – 1900: Mildred was single and living at home in Trevorton, PA.
1909: Mildred and Frank’s son Milton was born in Washington D.C.
1911: Mildred and Frank’s second child was born at an unknown location. 1913 – 1930: Mildred resided in Peoria, IL with her husband and children. 1940: Mildred and her second husband live in Virginia. Note: Bill was born in Indiana and died in Virginia in 1941. To Present: Millie’s descendants continue to live in the Manassas area. As fellow family historians, I am sure you all can see why I would be so curious about this fearless female ancestor of mine. 71 years – 2 husbands, 6 children (at least 3 died during childhood), 4 states, and one pretty sweet picture taken in a mystery Pittsburgh photography studio about 100 years ago. To celebrate Women’s History Month and honor our female ancestors, Lisa Alzo from The Accidental Genealogist has posted a series of 31 blogging prompts for the month of March. March 1 – Do you have a favorite female ancestor? Absolutely! My great grandmother Ada Mae Wetzel is my favorite female ancestor; she is also the only great grandparent I have ever known. Though she died when I was very young, I fondly remember my visits her and Aunt Gussie in North Philadelphia. The woman I knew and have felt connected to throughout my entire life was a mystery for much of that time. I did not grow up hearing stories or other memories about my great grandmother nor was anyone open to talking or answering my questions about her. I am certain that the secrecy surrounding her life and relationships only enhanced my desire to know more about the woman she was and the life she lead. 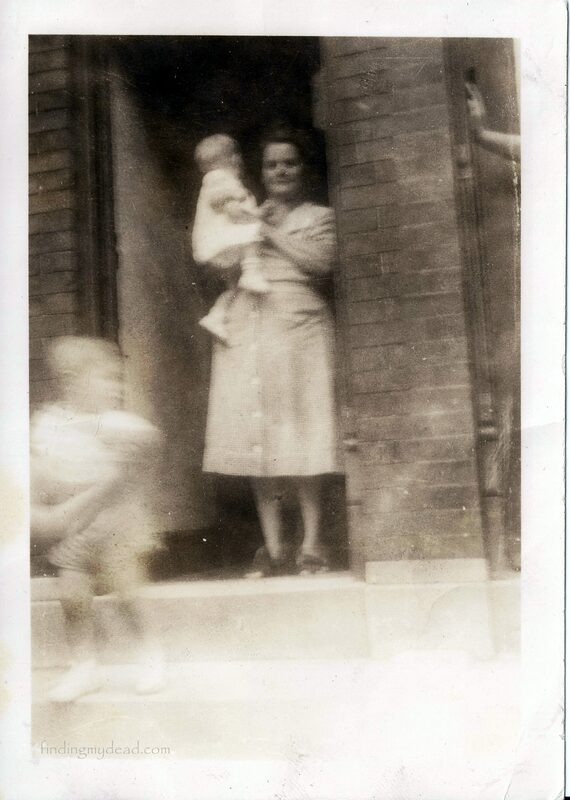 Bid in the doorway of her North Philadelphia home around 1950. Over the past three years I have not only learned a tremendous amount about Ada Mae but I have also been fortunate to meet “new” cousins of the removed variety that knew this amazingly strong woman and have helped to fill in many blanks as well as provide pictures and their memories of her. Many of my posts throughout this month will be dedicated to this remarkable woman most simply knew as “Bid”. 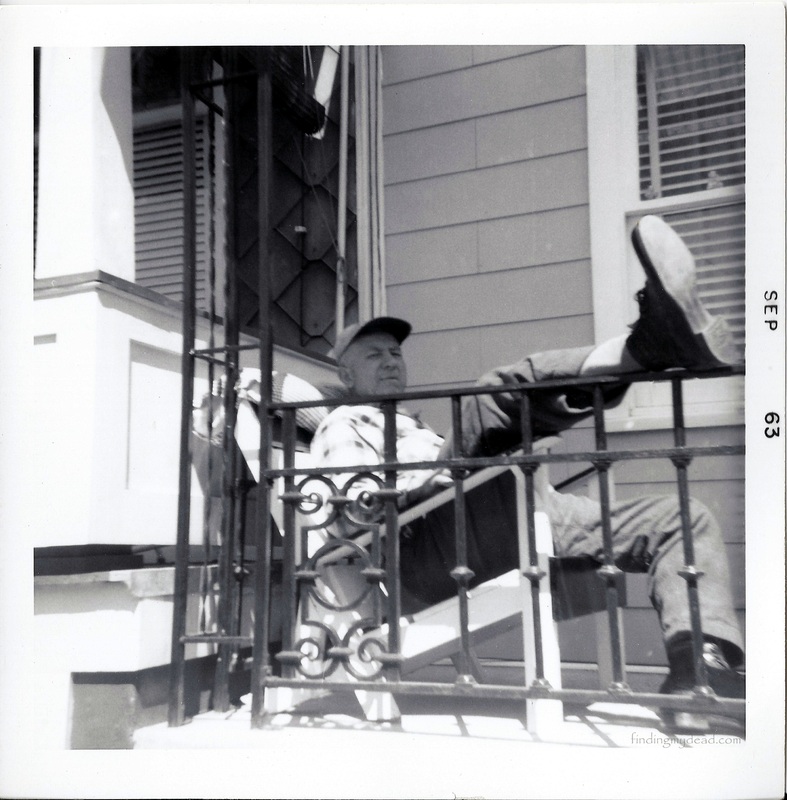 Earl Elliot Strausser relaxing on his Lynn Street porch. 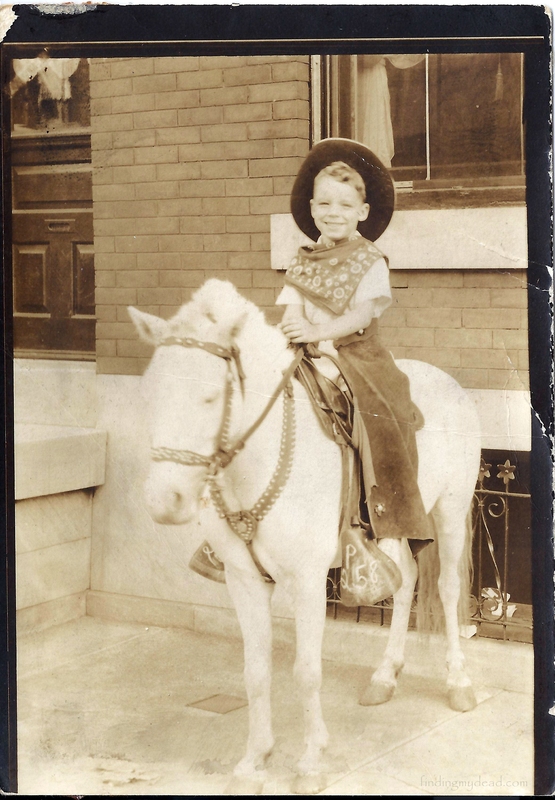 Little Howard Wetzel (ca 1940). The Strawberry Mansion (Philadelphia) photographer often used ponies in photos of young children. 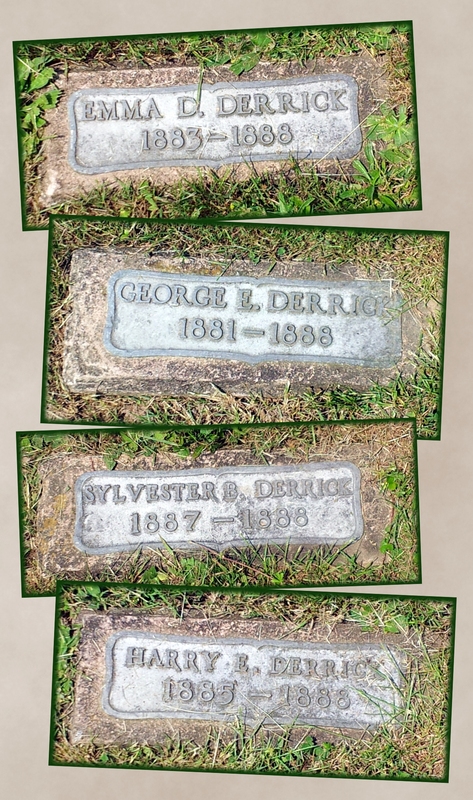 Four of the Derrick (Derk) children died within 10 days. 1888 was a sad year for Benjamin and Alice Derrick (Derk) as they buried all four of their children within ten days. The couple’s fifth child was born right in the middle of this tragedy and it is a miracle she did not meet the same fate. What killed these children? Cholera, Typhoid, Scarlet Fever, or possibly Yellow Fever? 1888 saw an outbreak of Small Pox in Pennsylvania; was this the cause of so much loss? Between 1881 and 1906, the Derrick family would have thirteen children born with seven surviving to adulthood. The four children here are buried with their parents and a number of the siblings at the Lutheran Cemetery in Trevorton.